The update to version 2.0 brings a few new features and changes to iToday. The first thing I noticed is that you now have the option to disable the video wallpaper. Which is an option that I think a lot of people will be happy to have. The actual lock screen display has also changed. There is a new battery charge icon which displays the amount of battery you have left in percentage. There is also a new section that displays your calendar events. It will display three up-coming events. I also noticed the the developer changed the dates so that they are displayed month.day instead of date.month. This application has potential however, it does not seem to pull accurate informaton for me. The up-coming events listed on my lock-screen are from seven months ago and the Birthday information is not correct either (it says the Birthdays are a day later then they really are). Let me know in the comments if you are experiencing the same thing! iToday is available through the Skrew source. 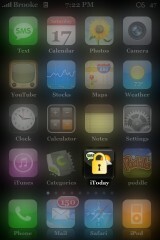 Note: iToday also has a new icon! – first of all – let the user choose the order and the widgets he wants to use. – then loose the fade in of the info when the screen is locked. Ya the up coming info. on the lock screen is back dated. Also, another thing i’ve noticed is the weather on the lock screen only updates when u manually launch the weather application…in that case, there’s no point displaying the temperature on the lock screen. Also, it would be nice if there was a way to disable the birthday icon, not that important, and it doe’snt work properly. But the major problem i’m having rite now is, that i can’t uninstall this application. The application is not listed under uninstall tab on my installer, so can’t uninstall!!! I was able to do an update this morning, when the package was downloaded it said ‘ main script execution error’ however, when i was on my springboard, the icon did change, and the version was updated. Please can someone help me uninstall this application. I don’t want to end up doing a restore for something this silly. you go into the weather app 1st.. also the birthdays also are inacurate as already stated…. this app is way too clumsy and aesthetically unpleasant to compete with intelliscreen. once intelliscreen allows the ability to edit your own feeds and fixes a few bugs it will be killer. What I’d love to see is iToday and Intelliscreen get together. The iToday dev seems to be a much better designer, but Intelliscreen’s functionality is superior. I have noticed after install of this app that it took some time to appear into my lock screen after applying the desired settings. After uninstalling this app it seemed to have left behind the wallpaper and also the text but no graphics. I know why this app is in beta because it has some major issues and I am thinking it is because I do not have springboard installed.